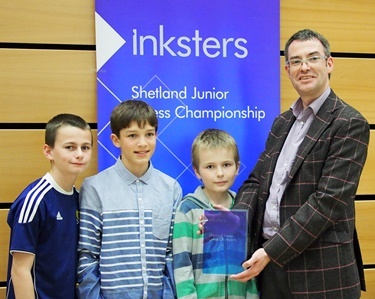 With one round to go the 2013 Inksters Shetland Junior Chess Championship was nicely poised, with two competitors, James Riise and Duncan Burgess on 3.5, followed closely by three players on 3 points. The lower board games finished relatively quickly, but up at the top the games were more even. Duncan Burgess, perhaps the find of the tournament, got into trouble against one of the joint champions from 2012, Dean McCusker, and Dean McCusker leap-frogged him to reach 4 points from 5 games. A few minutes later Finlay Mercer won through against the talented Ewan Sinclair to join Dean on 4. That left James Riise (3.5) facing his brother Luke (3). James had beaten both Dean and Finlay in previous rounds and now needed to beat his younger brother to become the champion. Luke gained a positional edge early on but James fought back tenaciously. With both players running out of time Luke secured the win. 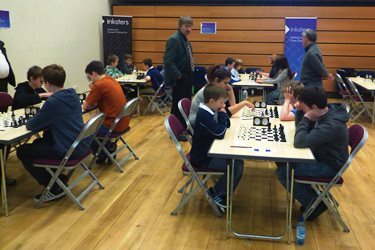 So three players share the 2013 Inksters Shetland Junior Chess Championship – Dean McCusker, Finlay Mercer and Luke Riise. Luke also picked up the prize for the best-placed primary school pupil. Behind them came 13 of Shetland’s best junior chess players. Dean McCusker, Finlay Mercer, Luke Riise and Brian Inkster.